Last time I was at Costco I saw the prettiest dark sweet Bing cherries. I walked by them several times but they kept calling out the words "cherry pie" to me so I bought them. 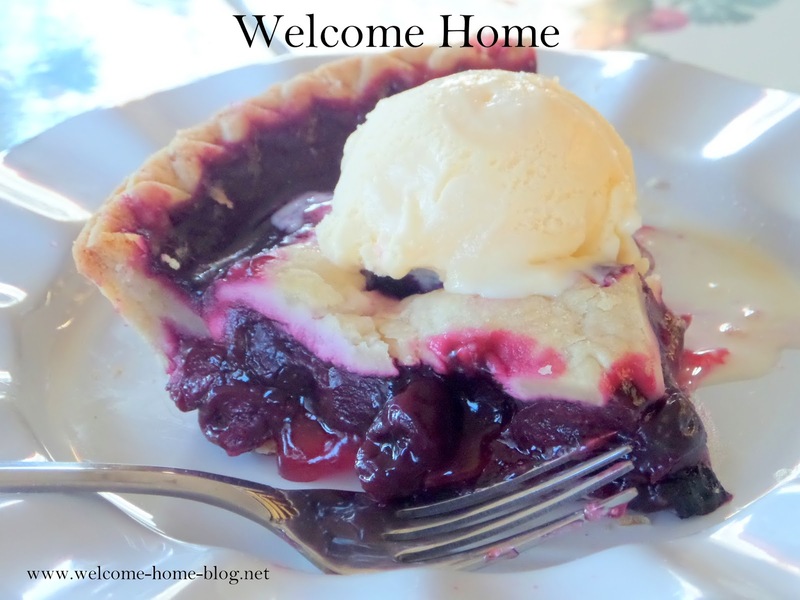 The next day I made the easiest and one of the most delicious pies. I took some short cuts on the pie crust but you'd never know because Marie Callender makes the best buttery and flaky refrigerated pie crusts! This pie turned out to be a winner. Place the pitted cherries, sugar, almond extract, lemon juice and corn starch in a large bowl. Toss until the cherries are well coated with the sugar and other ingredients. Make sure if using frozen crust, they are thawed completely. Use one for your pie and take the other out of its tin and on a lightly floured clean surface, roll out the dough. Using kitchen scissors or a pizza wheel, cut strips or shapes to go on top of pie filling. Place the filling in the pie plate. Dot with small dabs of butter. Cover with strips or shapes or you can even drop dough on top of the pie filling for that cobbler effect. Refrigerate for 30 minutes before cooking. In a small bowl, whisk the egg with a tablespoon of water or milk. Use a brush to brush over the top crust. Sprinkle the top with coarse sugar if desired. Preheat the oven to 425 degrees. Place the pie on a baking sheet on the middle rack of your oven and bake for 15 minutes, then reduce the temp to 350 degrees and bake for another 35 to 45 minutes longer, or until the crust is nicely browned and the filling is thick and bubbly. Serve chilled or at room temperature. Drain cherries, reserving the liquid. Add enough water to bring the drained cherry liquid up to 1 1/4 cups and add to small saucepan. Add cornstarch and sugar to saucepan, and heat, whisking occasionally until mixture comes to bubble and thickens. Continue whisking so no lumps form and filling is smooth. Remove from heat and add lemon juice and almond extract, fold in cherries. Follows the rest of the recipe above.